How does Red Hat handle third-party software, drivers, and/or uncertified hardware/hypervisors or guest operating systems? Red Hat supports Red Hat products when deployed on certified hardware, hypervisors or providers. Using Red Hat products on uncertified hardware, hypervisors, or providers is unsupported. Using Red Hat software in an unsupported configuration introduces significant risk to customer environments and should be avoided. 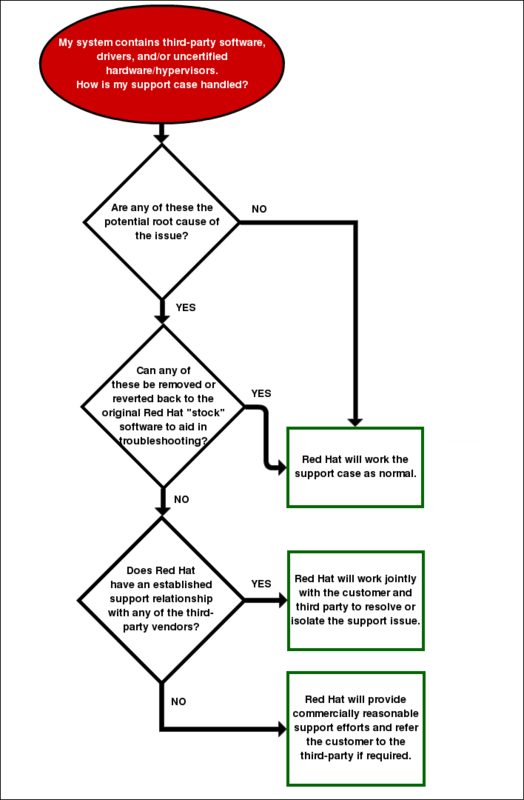 The following document describes how Red Hat, at Red Hat's sole discretion, may choose to support a customer that has not deployed according to tested, supported and certified guidelines. This document in no way endorses using Red Hat products outside of our published support matrix or other policies. For additional information on the strength, value and protections of the Red Hat certification programs please visit Red Hat Ecosystem and Certification Programs. There are two scenarios that are important to understand when you are using Red Hat software alongside non-Red Hat software, binary kernel modules, and/or uncertified hardware/hypervisors or guest operating systems.